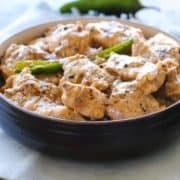 A pepper chicken recipe that’s made with just five ingredients besides chicken: onions, black pepper, green chillies, yoghurt and ginger-garlic paste. No muss, no fuss! Not in the mood for cooking something that takes hours to make and has an ingredient list a mile long? 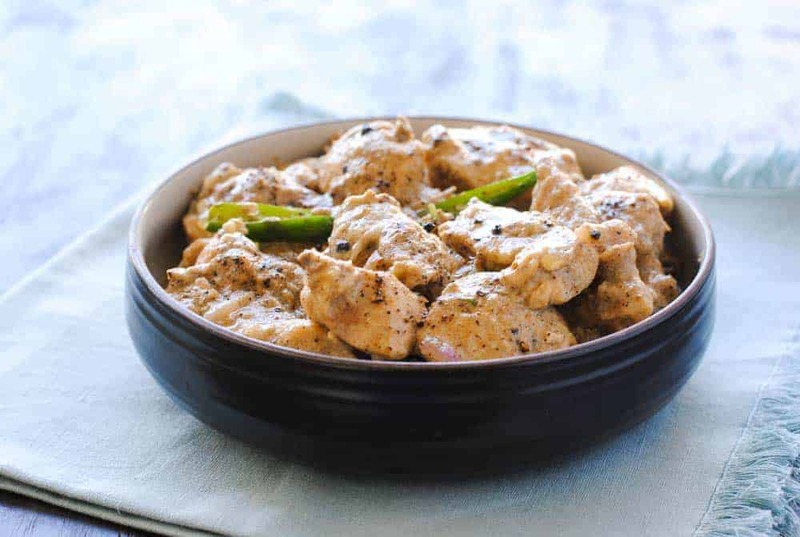 Try my pepper chicken recipe for a meal that’s healthy, easy and super-tasty. 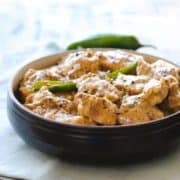 Every time I cook pepper chicken, it gives me pleasure to think that a nice, very different tasting recipe can be made with such less effort. Yes, ginger-garlic paste is something you’ll need to make or buy if you don’t already have a batch in your fridge (it is one of the staples of Indian cooking). But apart from that, the other ingredients are ones that most people already have. The point is that you don’t have to go grocery shopping for special ingredients just to make it. It’s that straightforward! 1. Use a pepper mill and turn it a few times on the coarse setting. 2. Grind some peppercorns in a spice or coffee grinder. Just a few seconds because, remember, you want coarse granules. So, if you’re planning to use the fine, powdery black pepper that’s been lying around in your kitchen cabinet for the last few months, ditch it, and get grinding fresh, black peppercorns while making this recipe. Your pepper chicken will be punchier with this simple hack, I promise you that! Take the yoghurt in a bowl and add ginger-garlic paste, black pepper and salt. Heat the oil in a pan and add the onions. When they turn pink, add the marinated chicken and cook on a high flame for 5 minutes. Lower the heat and cook until the gravy reduces and the oil separates (20 minutes). Stir once or twice. Add the green chillies, cook for 2 minutes more and turn off the heat. Did you make pepper chicken? Don’t forget to give it a star rating below! 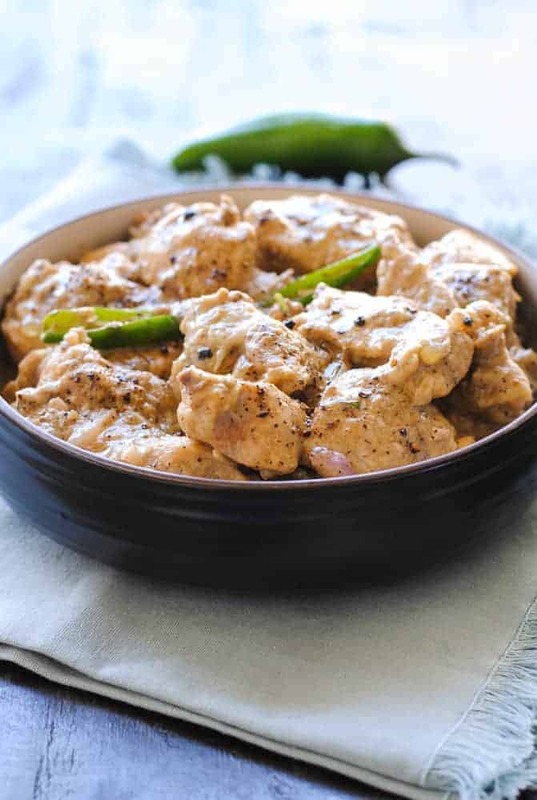 Pepper chicken with yogurt sounds just so right. Especially in summer, when you want something less rich but flavorful.Well this recipe has it all. Thanks for sharing. I agree. Freshly ground pepper is the way to go! I am drooling over this chicken! I love pepper with anything. Hubby doesn’t like it but he doesn’t know I sneak it in everything I make. I’m going to have to make this for this weekend’s BBQ so everyone can enjoy it without me feeling guilty about sneaking it as it is pretty obvious! 🙂 This looks so delicious!! Haha! You can’t ‘sneak’ in pepper in pepper chicken, for sure! I love how easy the prep looks! Can’t wait to try, seems like it will be perfectly creamy yet flavorful and light! Yes, it’s a cinch to make this, Whitney. And it’s super creamy because of the yoghurt. Do try it. “No muss … no fuss!” Perfect – that’s my kinda recipe for busy nights! And great explanation about using fresh ground pepper instead of those tired, spent little granules from an old spice bottle – seriously makes such a difference! Terrific post – thank you! You got it! That’s THE secret to making a punchy pepper chicken. Oh!! You know I haven’t made pepper chicken is years! It used to be my absolute favorite dish and looking at this now makes me wanna go make some. Looks so yum. Wow this pepper chicken looks real good.I have been wanting to try pepper chicken for long. This sounds fantastic! Green chiles are a great addition to any dish. This is a really easy dish and would make a great dinner option. With summer here, I hardly want to set foot in the kitchen and cook a big meal for the family. I’d much rather cook something easy and tasty and this recipe is something that won’t take a long time prepare. It’s also perfect for meal planning for lunches throughout the week! I agree wholeheartedly, Jessica! Who wants to spend time in the kitchen cooking elaborate meals in the summer heat? yum! This sounds so good and easy to make too!